“Don’t catch the sleeper. Stay at my place”, pleads Michael, Highlands GP, ardent ecologist and would-be lover. The married lady takes the train. So much for the ‘Swinging Sixties’. Writer and artist John Byrne wrote Uncle Varick in 2004 and sets it in 1967 within a 20 room pile on a Highland estate, all dark wood panelling, tick-tock, and parlour room landscapes. This Rapture theatre production invites you to see it as if framed within a distressed gilt surround. 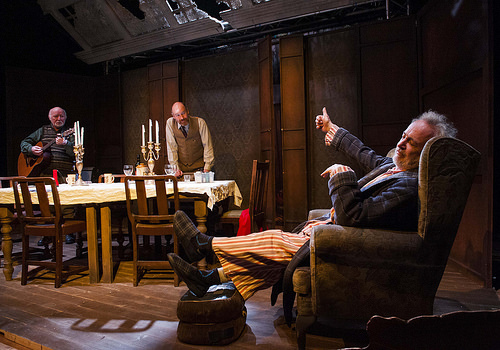 Its parent, Chekhov’s Uncle Vania, subtitled Scenes from Country Life in Four Acts, and very much the choice soundboard of Byrne’s work was written in the Crimea, 1500k from Moscow where it was first performed in 1899. No mention of trains in the Chekhov, just horses to carry you between those fiendish, prime, poles of town / fabby and country /boring, ‘parochial’. London is where Varick’s brother in law, overblown art critic Sandy, lives. First in Swiss Cottage, then in Maida Vale, but now – the impression gathers certainty – it is all proving too expensive and he finds himself cash poor, on painful legs, and has only the estate to sell. Only it’s not quite his to sell. He would have investment income and a small villa in Majorca. Of course he would, just as Chekhov’s retired professor, another Alexander, would have his wee dacha in Finland. Michael, once Mihail Astrov, has a map of the estate as it was fifty years ago – in 1917 or 1849, as you will – that charts a picture of decay as the old ways give out to be replaced by … by what exactly? And so the doubling continues between the uncles, Vania and Varick. Byrne’s idea is canny and pretty neat but now, only ten years on, it appears a little forced, a little hung up. For all their appeal, the Scottish characters approach caricature: there’s Kirsty Morag, the old housekeeper and sweet guardian of Scots, as in ‘muckle chainsaw, ken?’ and kind Willie John in cap, sporting breeks and Fairisle sweater. He plays sweet guitar though and sings three great and apposite Beatles songs from Rubber Soul (1965). A dun, knee length pleated skirt out of Dingwall Drapers opposes a showy 60s minidress from Lady Jane’s in Carnaby Street; bold is not the word for that hemline. Inappropriate for Invergordon would do. But there’s wild haired Jimmy Chisholm as Byrne’s Varick and he is well beyond naïve portraiture. Kirsty Morag would call him pawky. It’s a quick, spry, part that is both entertaining and woebegone. Chisholm may be dressed in baggy cords or pyjamas, dressing gown and slippers but that will not divert you from the nippy spirit of his performance. His opposition to vainglorious and impossible brother-in-law Sandy, is at Vania / Varick’s heart and while you just want Sandy to get ‘orf’ and away back to London (so strong is John Stahl in the part) you do enjoy Chisholm’s performance. Varick is heartbroken as well, which just adds crummy self-esteem to injustice. No requited love for him from Elaine (Selina Boyack), Sandy’s second wife. When Shona (Ashley Smith), Varick’s niece and all-round lovely person, sings Cry Me a River you know the emotional landscape is unrelieved and forlorn. In such a place it is Michael, a poignantly lucid George Anton, whom you notice and listen to. There are amusing moments: smile at the use of flock wallpaper and laugh at a couple of funny break-out lunacies – but otherwise Uncle Varick is more serious and contemplative than you might think. Can it bring Ross and Cromarty, with its estimated population of 50,000, to Greater London’s 9 million? Perish the thought! All we do have in definite motion in 2014 is the Invitation to Tender for a separate Caledonian Sleeper Service ‘in order … to develop a transformed product offering that will secure its future as a sustainable business.’ Well, all the more reason for Elaine to refuse Michael’s bed. Visit Uncle Varick homepage here.